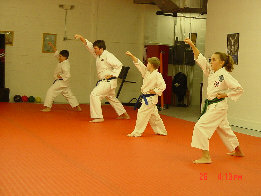 In tradtional martial arts, as the student progresses, they are regularly tested in their skill and overall knowledge. 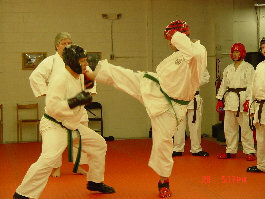 With each new level, the student is required to perform all the kata they have learned to that point. 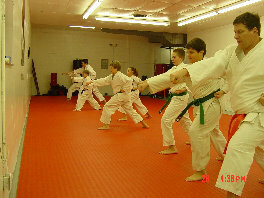 A group of students perform Empi, a brown belt kata. 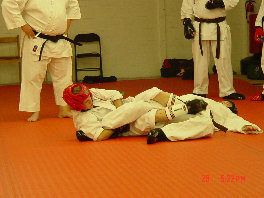 With each new belt level, the student learns and must demonstrate the kihon (basic) techniques they have learned. 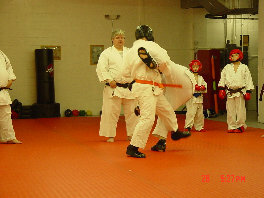 One step sparring or kihon ippon kumite is fun, and depending on your skill level, the students must block and counter attack . . .
as well as performing joint locks, chokes, and other holds. 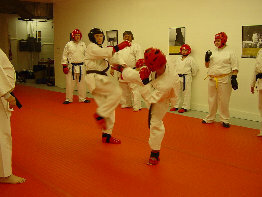 Jiyu Kumite, or free sparring, is also performed at each belt level test. As the student progresses, these sessions become more intense, and the combinations more complicated. Focus and control are crucial to the success of any martial artist, and these skills are constantly honed during class sessions, and demonstrated in a variety of ways as the student ascends to higher belt levels. 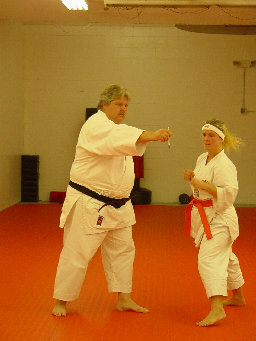 A student demonstrates focus and control by striking very near a pen or pencil without hitting it or Shihan.